The O.C. 's Jackson Rathbone has been named as Sokka. Casting folks are looking for extras to play soldiers, martial artists, dancers, gymnasts, athletes and families - specifically physically fit people from 18 to 65 years old. The open call will be 10 a.m. to 4 p.m. Saturday at Bullies restaurant at the Wachovia Spectrum. You're asked to dress casually or in the traditional costume of your family's ethnic background. Info: lastairbendercasting@gmail.com or 215-574-7878. We've called the number provided and this seems to be completely legit. Several people have commented suggesting that those protesting the casting decision should have a presence there, and we're inclined to agree. However, it's very important that we all conduct ourselves politely, peacefully and responsibly. • Peacefully and respectfully protest the casting decisions, and tell the local media that you plan to do so. If you want to organize a protest, relevant information regarding applying for permits and such can be found here. EDIT: drmoonpants is trying to put together a list of those who plan to attend. Please reply to this comment if you think you'll be able to make it so that we can get a headcount. If you cannot make it to the casting call in person, we encourage you to send short, polite messages to the email address above (or leave equally short, polite voicemails) briefly explaining your objections to their casting decisions and asking if and when Blinding Edge Pictures plans to make a statement regarding this controversy. We started inside but they kicked us out almost immediately so we moved to the bottom of the front steps where people came in. A lot of people didn't care, but a lot of people also stopped and listened, although most of them went in to audition anyway, even though they agreed with our cause, disappointing yes, but creating awareness is the first step. Only 4 people turned around and left after listening to what I had to say because they agreed that they wouldn't contribute any time or energy to the movie until something was changed. Some people said some negative comments but nothing outright nasty or angry. A lot of people looked at my reference pictures and saw how deeply ingrained the Asian culture was in the show and agreed that the casting didn't make sense. We stayed from 9:30 to 1:30 and I was pleasantly surprised how many people sympathized with our cause. The Philadelphia Inquirer took some pictures and took my name as well as some of the other supporters. Channel 3 news was there and the reporter said that even though she regretted wasn't there to cover our story she still completely agreed with our cause and wished us the best of luck. I know they only are allowed to cover the stories they're sent out for but it was nice to have a local anchor person and crew take time out of their busy day to support us. Though the local radio station KYW 1060 COMPLETELY ignored us even though it was interviewing people who auditioned RIGHT in front of us. The interviewees even said the protesters were the best part of the day! Over all we created a lot of buzz and I made sure every person coming in and out heard our message of equality. I would have loved if every single person would have turned around and left but that obviously wasn't going to happen. Getting people to talk about it is the first step. We also handed out flyers with links to this site and Derek Kim's exceptional blog and and excerpt from his blog. michael klein from the philadelphia inquirer wants to speak to the protesters! Thank you SO MUCH for doing this! I'm SO DAMN PROUD, seriously, and it's amazing that you not only stood your ground and got the message out, you made some new allies and maybe even changed a few minds. And that's at the core of what all of this is about -- not just holding Paramount accountable, but raising awareness and making people think. Would it be all right with you if we posted about this in a main entry on the blog? You and djinnj are seriously amazing and so very brave. I am crying right now, like really. Hooray to you for going about this with such integrity and getting people informed. Hooray to the media who took an interest in our story! Only 4 people turned around and left after listening to what I had to say because they agreed that they wouldn't contribute any time or energy to the movie until something was changed. Honestly, that is a HUGE accomplishment. I'm really proud of you and you should be too! Thing about how many people those 4 are going to tell, and even everybody else who still went in, how many dinner table conversations this is going to inspire? Lots of people are going to start to get it, and that it's not just about Avatar, because of you. You freaking ROCK, dude. I wish I could phrase this more eloquently and explain how much it means to me that you went out and did this, although I think "ROCK" has its good points as a descriptive of this scenario :B I've been involved in protests before, and know it takes a MASSIVE amount of courage to be one of the few in a much larger crowd. I'm pleased to hear that you obviously raised awareness and even changed some minds! Incidentally, would you be able to provide a rough estimate of the types of people going in to audition as extras? Casual or "traditional costume" dressed? Young or old? Caucasian or people of color? Ditto an estimate of the people who seemed to agree with your cause but went in to audition anyway. Man, massive, massive thank yous to you and djinnj. I'm thrilled you guys put in the time and even got to talk to some media people -- it's amazing, and you're amazing. I wish to hell and gone that the timing hadn't been so utterly horrible and I could have been there myself (I think I was slaving over a keyboard literally the whole time the casting call was going on T_T), but I'm ecstatic that you made it and, from the sound of it, were really able to make a difference. My hat is off to you, and here's hoping we'll all be there next time. I am so incredibly pumped and impressed and overjoyed to hear this. If I didn't live in Canada, I'd be right there with you protesting but I'm glad that, even without large numbers, you stayed strong and delivered the message. And a lot of people listened! That's definitely the first step. Though the local radio station KYW 1060 COMPLETELY ignored us even though it was interviewing people who auditioned RIGHT in front of us. The interviewees even said the protesters were the best part of the day! BWAH HA take that KYW!! This issue really is gaining momentum! I am so, so proud of you. Really, thank you so much for doing this. I only wish I could have stood alongside you, instead of being stuck in California. OMG. You and Dale are my new heroes. Like, I'm so proud to be associated (distantly, lol) with you guys. Good Job! The fact that you guys spread the word and got FOUR (!!!) people to walk out of a job opportunity (especially with this economy) is AMAZING. You guys have made a difference and are just...AMAZING. I just...wow. I applaud you all. Good luck with your interview. I know we're a bunch of geeks and all, but we support you! 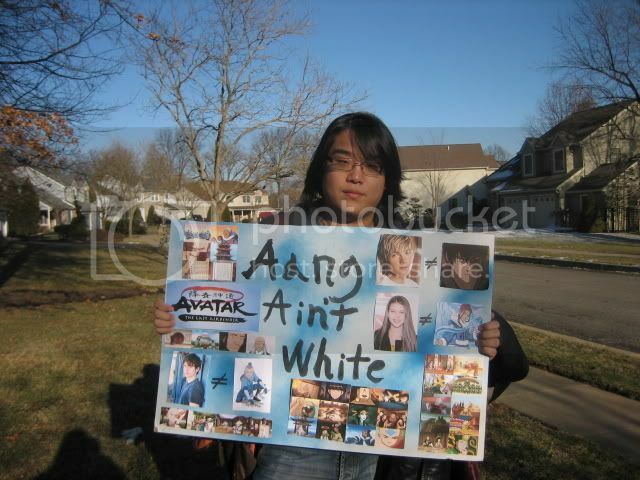 Northwest Asian Weekly - 'Avatar' Whitewashed? Sci Fi Wire - Is Airbender Casting Racist?